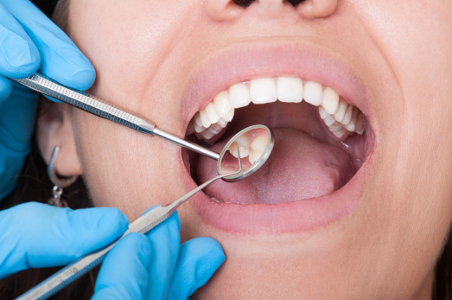 When is the last time you had a dental exam? Patients should remember the importance of coming in for a dental checkup at least twice yearly. We promise to make your experience pleasant and effective. What’s even better than an ordinary dental exam? A state-of-the-art dental exam that incorporates the latest dental technology. Dr. Randall employs cutting edge technology for safer, faster, and more productive patient visits. If you have ever worried about the hazards of radiation, come take advantage of our digital x-rays. Digital x-rays emit far less radiation than conventional x-rays for the safety of you and your loved ones. Digital x-rays will allow you and your dental professional to see your results sooner than ever. The images of your mouth will instantly transfer to a computer screen where you can study your oral health and ask your dentist questions. Oral cancer screenings should be a part of your ordinary dental care routine. During this examination, Dr. Randall will look for warning signs of potentially cancerous conditions. Our oral cancer screening technology allows us to detect the first signs of oral cancer. The earlier your oral cancer is detected, the greater chance you have to find successful treatment. We suggest that patients have an oral cancer screening annually. The most effective defense against a serious illness like oral cancer is early detection! At Chino Valley Family Dental, we are proud of the advanced technology we offer our patients. Call our office to schedule dental examinations for you and your family members today!